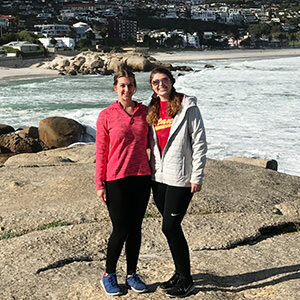 Brennan helped young students in Cape Town as part of an Elmhurst College service-learning course, South Africa Service and Interdisciplinary Study. The students were assigned either to a preschool or elementary school for 10 days, or worked with the Mustadafin Foundation, a community organization that deals with humanitarian and social issues. The trip concluded with a visit to a wildlife preserve. Brennan and Rebecca Blaufuss ’18 each did an extra project to earn Honors credit. Blaufuss, an elementary education major from Cleveland, Ohio, wrote a paper comparing South African and U.S. schools in the methods and standards used to teach math. “I [was] interested in getting exposure to another country’s education system,” she said. Brennan, a computer science major who grew up in Chicago suburb of Tinley Park, planned a project on the history of South Africa’s music culture. She was inspired by education professor Therese Wehman, one of three faculty members who led the trip.